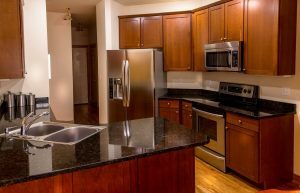 Can Granite Countertops Impact Your Home’s Value? Your home may easily be the biggest investment you make in your lifetime. Not many purchases you make cost upwards of $100,000. So, it only makes sense to make sure that everything inside this investment is well taken care of and top notch. While some trends come and go, granite countertops have stayed and thrived. Granite is easily one of America’s most-loved looks due to its uniqueness. Granite countertops are durable and affordable. With granite, you get what you pay for (and more). You will love the way it looks and, if you ever choose to sell your home, the granite countertops will be a selling point that will put money back in your pocket. Granite countertops are easy to maintain. Just like other countertops, granite should be cleaned and taken care of properly and regularly. Granite countertops are very difficult to stain or scratch. Granite is a very hard, durable substance. If a stain or scratch occurs, you can take the appropriate steps to remove it. After choosing beautiful granite from Williams Fabrication, hire the right contractor for the job. With granite countertops, your home will look and feel new! Contact us today with any questions you may have or come by our store to see our products.